Chabad-Lubavitch emissaries are on another "mission from G-d" -- this time, organizing volunteers for hurricane relief in New York City. 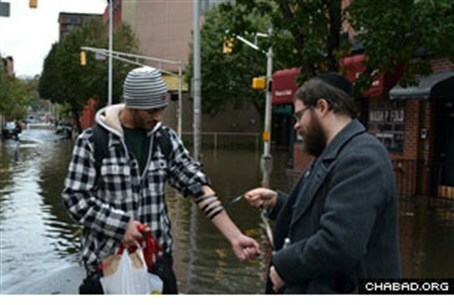 Chabad-Lubavitch Hassidim are determined -- in fact, generally unstoppable -- once they are on "a mission from G-d."
Hurricane relief is part of the deal; this time, they are organizing volunteers to help those who were hard hit by Hurricane Sandy in New York City. It's another day on the road for Chabad-Lubavitch emissaries. Never mind that their homes were hit too. A bus load of NYC Chabad Midtown Manhattan young professionals is set to head out Sunday to help with relief efforts in Long Island. The volunteers planned to help people with clearing the sand and other waterlogged debris that was swept into their homes by Hurricane Sandy last week. Other teams on the bus will be tasked with distributing supplies such as batteries, socks, warm food and other essentials. A third set of volunteers planned to set up a soup kitchen where people can gather for warm meals in the disaster zone. A similar bus load of Chabad-Lubavitch volunteers was also scheduled to set out from the Crown Heights section of Brooklyn to provide similar relief to their neighbors living in the much harder-hit areas of their borough. Chabad-Lubavitch emissaries were among the first to search for survivors and help provide food and other supplies for those who were hurt in Japan last year during the deadly earthquake-tsunami that struck northeastern Japan in March 2011. Some 15,000 lost their lives in that disaster, and countless others were wounded, homeless and displaced for months. It was the same during the Indian Ocean tsunami that struck southeast Asia in December 2004. Hundreds of thousands of people died -- and Chabad-Lubavitch of Thailand worked tirelessly for days around the clock with Israel's Foreign Ministry to locate missing people, contact relatives and provide food and other relief to those in need. This time, a hurricane relief fund has been set up by Merkos L'Inyonei Chinuch, the educational arm of Chabad-Lubavitch, whose proceeds will go directly to projects on the ground, the worldwide Chassidic organization announced. Many emissaries themselves lost their homes as well, and Chabad centers throughout New York and New Jersey lost tens of thousands of dollars' worth of holy books, furniture and supplies. Nevertheless, the rabbis were out in force throughout last week as well as Sunday, going door to door to provide food and water, as well as spiritual and emotional support. Rabbi Mendy Kasowitz of the Chabad-Lubavitch Center of Essex County told the local baker he should take his own generator, in fact, in order to ensure there would be braided loaves ready in time for the Sabbath. "The community needs challahs,” Kasowitz said simply in an interview with Chabad.org just prior to the Sabbath. By midnight, there were a few hundred loaves ready to be distributed, and Kasowitz had plans in place for volunteers to deliver them to home-bound seniors stuck in their darkened homes. Others were sent to community-wide Sabbath dinners where power had already been restored, thus ensuring that hundreds of Jews began Friday evening with at least some semblance of a "normal" Sabbath meal.